Marianne Nicolson’s paintings graphically depict the back view of two tunic forms placed upon black- and grey-bordered backgrounds. 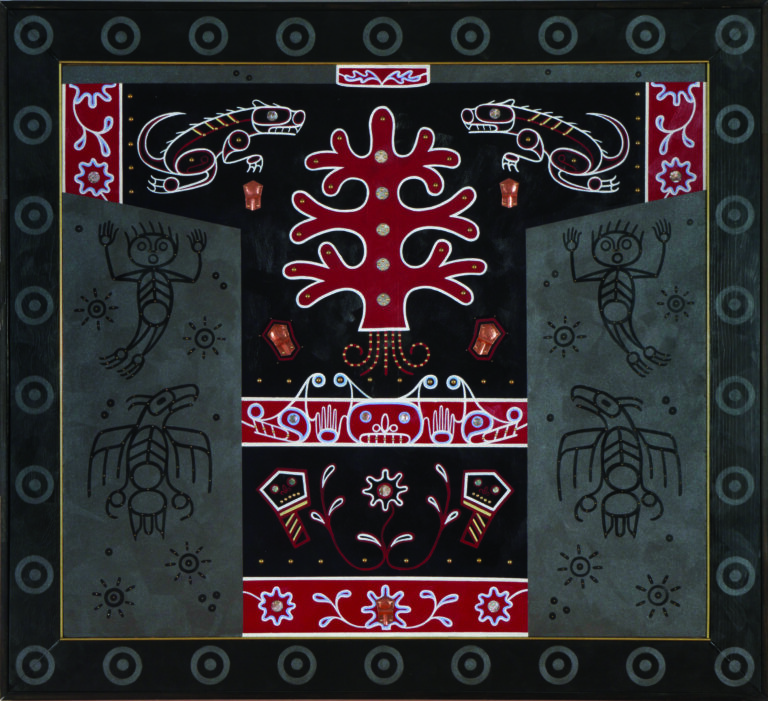 Ghostly traces of raven, human and wolf figures float on the negative spaces like constellations, while a tree of life along with thunderbird, mink and serpent forms sit in bold symmetry on the tunic shapes. Signifying wealth and social standing, coppers (both intact and ceremonially broken) are affixed to the panel, as are abalone discs, coins and military-style brass buttons. With these paintings, Marianne Nicolson addresses the shifting state of economic growth and decline amongst the Kwikwasut’inuxw and Dzawada̱’enux̱w – the Gilford Island and Kingcome Inlet communities of Nicolson’s ancestry – following from contact with non-Indigenous peoples. The “changing tides” of the titles suggest the irresistible forces of economic and cultural change as fortune and influence turned from a mutually beneficial economic relationship in the 1880s to an amplified campaign of cultural suppression. The earlier period saw an influx of wealth through trade and the availability of new materials – as well as the introduction of decimating diseases. The tradition of button blankets and tunics grew from access to new materials, emerging when the culture was intact enough to incorporate new materials into existing forms in ways consistent with tradition. The 1920s saw the enforcement of the anti-potlatch laws that had a devastating effect on the social, cultural and economic well being of many Northwest Coast communities. On the Kwikwasut’inuxw painting, centered on the Thunderbird’s abdomen, is a coin dated 1929. This is the year that the tides turned on the decline of the Kwakwa̱ka̱’wakw, marking the beginning of a population revival that continues into the present. Tracing the push and pull of world views through the materials she uses, Nicolson’s work is part of a contemporary resurgence of Indigenous cultural practice and a means to resist its political and social assimilation. These works are presented in conjunction with the exhibition To refuse/To wait/To sleep at the Morris and Helen Belkin Art Gallery, and is a collaboration between the Morris and Helen Belkin Art Gallery and the Walter C. Koerner Library at The University of British Columbia, and is made possible with the generous support of the Audain Foundation. Art in the Library offers new perspectives on contemporary art by presenting art that questions our current perceptions about the world around us. Marianne Nicolson, Tunics of the Changing Tide: Dzawada’enuxw Histories, 2007.